The reason for responding to Bodu Bala Sena (BBS) General Secretary Ven. Galagodaaththe Gnanasara Thera was that he was considered a political leader, SLFP Spokesman and Minister Dilan Perera said. “I was not talking about the Asgiriya Chapter but about a political party. Ven. Gnanasara Thera was in a political party and contested the 2015 Parliamentary Elections but failed. I respect Buddhist monks” he said while addressing the media during the SLFP media briefing at the party headquarters today. When a political issue was raised by a Buddhist monk, who was in a political party, I should respond on the political issue. I have never insulted Ven. Gnanasara Thera But he insulted me reminding all animals except the lion. But I did not respond out of compassion. Minister Dilan, being a Buddhist Monk getting into the politics is also a crime. Not only naming you with all wild animals but also Gnanasara used bad filth, which a monk should not utter. Mr. Dilan, you are really a gentleman, despite of Ven. Gnanasara Thero scolded you using dirty filth, you tolerated and still you respect him, but honestly he should remove his rope and grow his hair like a rowdy. Yes, Minister Dilan is a decent gentleman he never bows down for any evil - example: Boru Sobana Gnanasara. Dilan, don't give up your run until Gnanasara is put into the cell. Mr. Dilan, the entire nation watched how Ven. Gnanasara Thera was dashing you with filth, now its your turn, somehow talk to President and keep this fellow behind bars. Thanks for bringing the 'COBRA" into the limelight again. As for me, this election symbol along with ghanasara was forgotten. Yes of course - the chap contested - and obtained a resounding ( I almost said VICTORY" ) slap from the voters. And Prabhakjaran should be considered a better politician!!! First and foremost all humans are equal no matter what color, creed or dress he is wearing. First we should address this inequality. VEN. 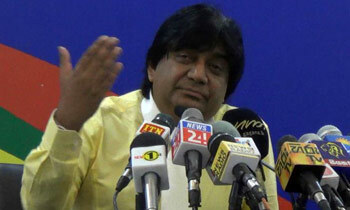 GNANASARA HAS CHAMPIONED AT ADDRESSING THE GALLERY.FOR ONCE I AGREE WITH DILAN PERERA'S REASONING. YOU HAVE COME OUT A WINNER BY LEAGUES. GOOD JOB. That my dear Tony, is a LONG HAUL (.a prolonged and difficult effort or task. )..